As our third guest blogger, I’m delighted to have my friend and teacher, Bryan Alexander, a leading thinker on digital media–see his wonderful new book, The New Digital Storytelling and follow him on Twitter (if you can keep up! )–, a blogger on all things gothic, and a homesteader who lives 20 minutes from me but in an entirely different growing zone–the mountain village of Ripton, Vermont. Yes, it’s cold up there (a good thing today), the realm of forest, moose and bear–a world away from the valley. Snow and chill, white landscapes and the long dark: these memories lace through our homestead even in the brightest, greenest, warmest summer days. It seems counterintuitive or just plain wrong to summon up January in July, when our forests are thick with leaves, and our garden plots rife with gloriously productive plants. Peas climbing trellises, tomatoes swelling on their vines, potatoes busily thickening spuds underground, weeds desperately fighting to replace their plucked predecessors: these are tangible signs of verdant nature, of life’s outrageous ability to return and grow. The persistence of sunlight until long after dinner feels like the experience of another world, a planet other than the one we recognize during Vermont’s Plutonian winter. But we garden against the long cold. We time the first soil-turning by the gradual arrival of late spring. Just before May we can peel off the outer layers of compost, while the inside remains a frozen core. Summer arrives as a kind of calendar freshet, fast and adored, then quick to end. In July it’s hard to celebrate a corn stalk’s sudden shooting upwards out of freshly-laid soil when we remember just how few weeks remain between this moment and the first freeze. The taste of broccoli head plucked right off the plant is delicious, made more savory because of the closeness of winter’s bleak threat. We can delight in a new potato patch’s flourishing, but see before us the temporal horizon of rock-solid soil; thrusting hands into the soil to find tubers is deep pleasure, but sharpened by being on a tight timeline. Our growing season is a narrow, quick thing, a scherzo in between dark andantes . So preservation looms over our consumption. Each bean nibbled from the plant is one we can’t can. We relish the plenitude of potatoes grubbed from mounds, then stretch out that yield across the calendar, seeing how many we will reserve per week. As summer’s plants thrive, we shift our assessment of what will become our leading stores, and practice cooking accordingly. Potatoes looking good? Time to try out new potato soup recipes and mashed potato variations. Is corn doing well? August means working on milling. Our animals are closely bound to this winter-bracketed timeline. 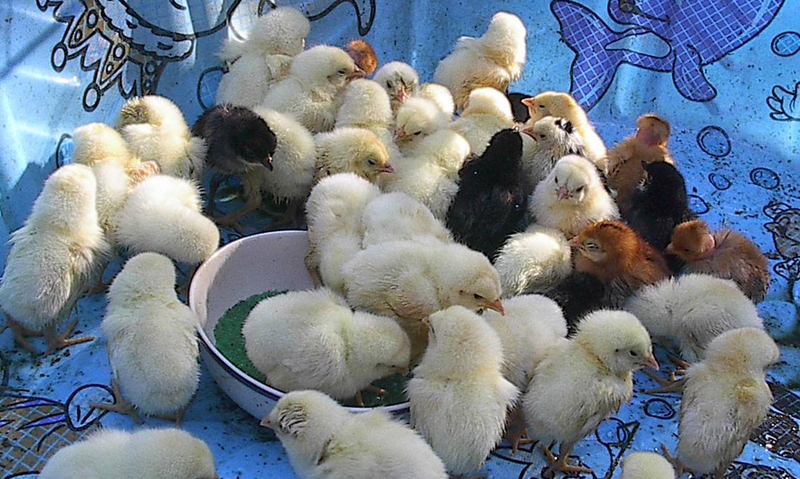 Baby chicks arrive around the longest day of the year, and start walking and pecking in a vast metal tub during some of the hottest days. Outside the goats, grown chickens, turkeys, and ducks munch happily on summer’s bounty: grasses and weeds, bugs and larvae. The cats stalk or ignore them, prowling through flowers for Luna moths and carelessly low-flying birds. Chickens lay eggs generously, considering the long, long daylight hours to be a sign for increased production. We bake and fry eggs, building frittatas and baking gluten-free breads which use egg for thickening and additional flavor. As July becomes August, the eggs accumulate beyond our ability to eat them all, and become trade goods. At the same time the meat birds grow and fatten, increasing in girth and height as daylight hours and average temperatures decrease. Their destiny draws closer as squash swell under vines. Autumn’s onset means killing and butchering the chickens during several bloody days. Once again we work against the calendar: each carcass placed in the freezer counts for meals in January or March. Fried, stir-fried, stewed; coq au vin; soups: we remember and practice recipes, recalling that the kitchen’s heat we now endure will be a welcome thing in February. 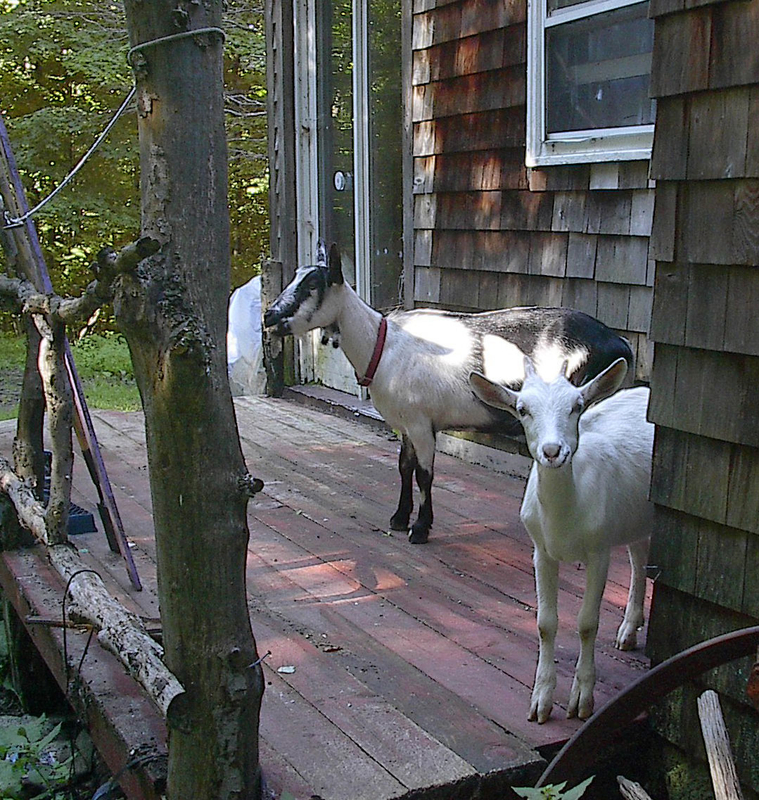 Winter is coming: our summer homesteading is a frantic, happy plunge into a briefly accessible Earth. Our goal is to wring two-thirds of a year’s eating out of four month’s work. 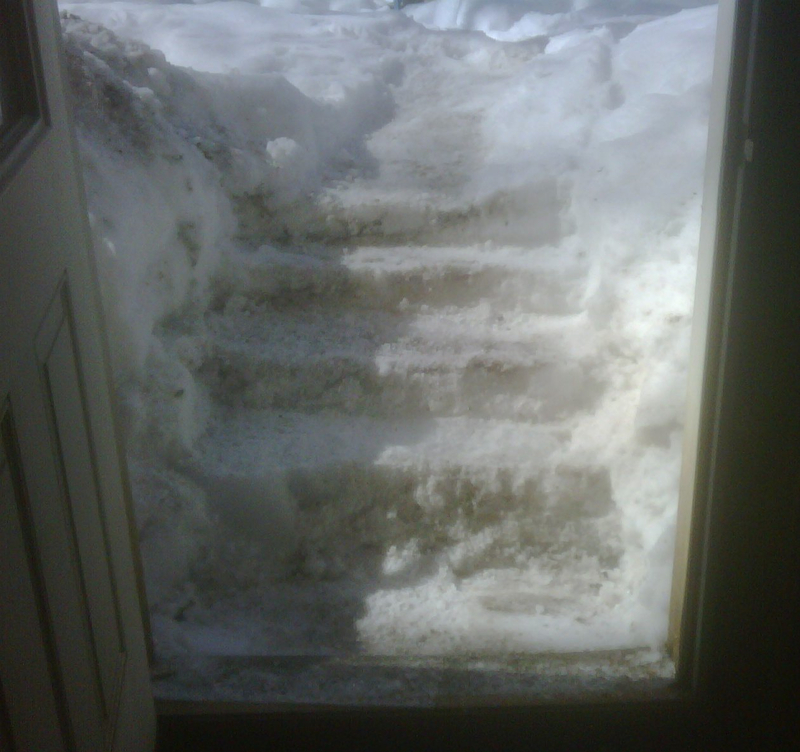 We coax another realm into life between parentheses of snow and ice, building bulwarks of meals against the cold dark. Lovely post…. I have been thinking about winter, too, as my potatoes have come in ( first time I have grown them) and are so delicious i want to eat them all now…. but won’t. Thank you for the lovely writing, images, and thoughts. I love this post, too, Kate–how Bryan listens and looks at the now yet thinks about and feels the bigger rhythms of the year. He is a wise homesteader! Harvesting my garlic this last week and hanging it to dry from the beams and rafters has me thinking ahead to fall and winter, too, loathe as I am to do so even in this intense heat. Thank you, Kate. 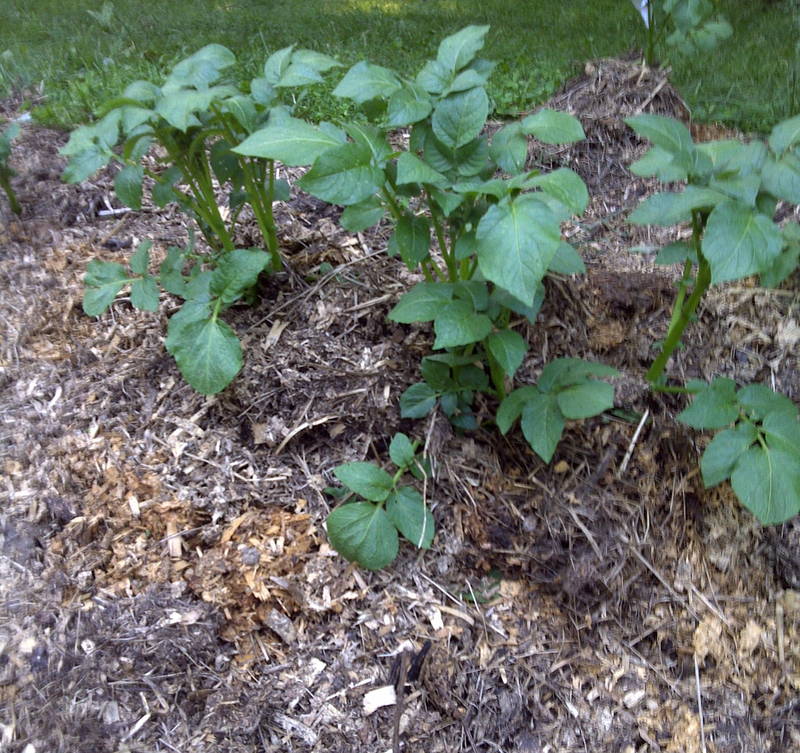 How are you growing your potatoes? I’ve always grown them the traditional Irish way–in lazy beds. Are you finding any difference in the output, flavor, size, health of the potatoes between these ways? How about insect damage?